Teaching Without Walls: Life Beyond the Lecture: 8th Annual #ET4Online Symposium - join us! 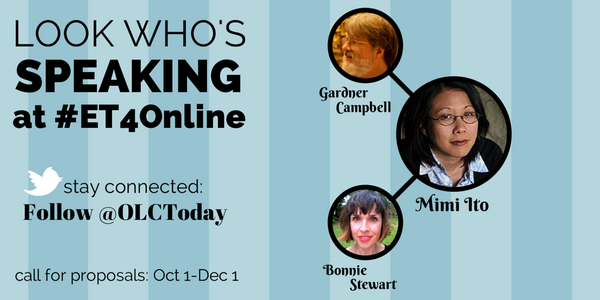 8th Annual #ET4Online Symposium - join us! Sloan-C has been newly rebranded as the Online Learning Consorutium and this April, the Emerging Technologies for Online Learning International Symposium will convene in Dallas, TX for its 8th annual event. This year's symposium, which is a joint event with MERLOT, is shaping up to be dynamic! Mimi Ito is confirmed as the keynote speaker. Ito (@Mizuko) has contributed ground breaking research about the impact of digital media on today's youth. Gardner Campbell (@GardnerCampbell) and Bonnie Stewart (@BonStewart) will be presenting the plenary talks at the symposium. Together, these presentations will engage in a mindful exploration of how emerging technologies are reshaping formal and informal learning, as well as impacting the nature of identity for us all. Also included in this year's program you'll find the Technology Test Kitchen, where brief hands-on sessions will be conducted to introduce you to an array of new technologies that hold potential for reshaping and improving the way we teach and our students learn online. The Technology Test Kitchen was introduced at #Blend14 and will also be part of the OLC's International Conference in Orlando at the end of October. I'm really looking forward to this new program feature! The Launch Pad will also be back again this year with a new feature -- the Teacher Tank, which will provide our Launch Pad participants with an opportunity to pitch their product to a panel of online educators. Anchored in the context of formative feedback and learning, this event will be fast-paced and high energy! Join us! Submit Your Great Ideas: CFP Opens 10/1! If that whets your appetite, mark your calendar for the Call for Proposals which will be open from October 1-December 1 (no extensions will be provided). YOUR participation will make this symposium more diverse and representative of how emerging technologies are reshaping online teaching and learning. I hope to see you in Dallas!